Charles “Chuck” Collier passed away in peace on April 17, 2017, at Cottage Hospital at the age of 95. He was the third of five children born on September 4, 1921, to William and Mary Collier in Salem, Oregon. He grew up in Marin County and graduated from Tamalpais High School. His higher education resulted in a Master of Science degree in Chemistry from the University of California, Berkeley. During World War II, he received his commission in the U.S. Navy and was stationed in Connecticut as a Lieutenant working on submarine navigational systems. During that time, Chuck attended a USO event in New York City and met his love, Barbara, who was a U.S. Navy nurse. After completing their service to their country, Chuck and Bobby relocated to Northern California and then Santa Barbara, which they considered to be paradise on earth and where they raised their two sons, Pete and Matt. 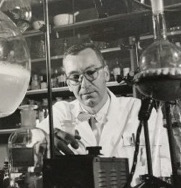 Chuck worked as a food technologist with Pea Soup Anderson’s, where he researched and developed food preservation techniques. He eventually pursued his interest in graphic arts and developed a widely used chemical process that enhanced the resolution of color photographs and illustrations in magazines and newspapers across the country. He retired happily from his company, Fluorographic Services, at age 75. Chuck’s wife Bobby, son Pete and four siblings preceded him in death. He left behind his son Matt, daughters-in-law Roberta and Fran, granddaughter Marisa Glisan, sister Martha Trainer, numerous other relatives and countless friends. Chuck was a lifelong leader, jokester, intellectual, big personality, family man, reader, fan of crossword puzzles and Sudokus, and all around great guy. He was an avid tennis player who enjoyed playing three days a week until he hung up his racquet at the age of 88. Chuck was the catalyst for the poker game with his buddies every Thursday night for over 50 years. He also loved to ride through town in his classic Sunbeam Tiger, revving the powerful engine, laughing out loud and peeling out ahead of startled younger drivers when the light changed. He was fond of quoting poetry to his family, especially to make a point that he thought they should learn. People who knew Chuck often say he lived life to the fullest and made others come alive. He found the ultimate life with his Savior on Easter Sunday, the day before he passed away. One who met him during his recent residence at the Villa Santa Barbara remarked that he lit up the room when he walked in, and that it was a pleasure to know this very, very special man. He was sincerely loved, is now missed, and will not be forgotten. Chuck, you will always be in our hearts until we see you again. A celebration of Chuck’s life will be held at a later time.